Economic growth is key for the financial market outlook, and we expect growth to slow materially as the post-crisis recovery enters its late stage. The slowdown is likely to be led by the U.S. but we see it partly cushioned by more steady growth in Europe and emerging markets (EMs), notably China. We expect the Chinese economy to regain its footing in the first half of 2019, thanks to stimulus measures already in place and others expected to come, slowing – but still growing. China’s policymakers are seeking to boost the economy through a range of channels, including tax cuts, injecting fresh liquidity via cuts to bank reserve requirements while relaxing macro-prudential measures aimed at limiting financial leverage. A more gradual downtrend in China’s gross domestic product (GDP) growth–rather than a sharp slowdown–should underpin growth in other EMs. The IMF projects that China will account for about a third of global growth in 2019, compared to roughly one tenth from the U.S. This shift would follow a surprisingly sharp local slowdown in late 2018. 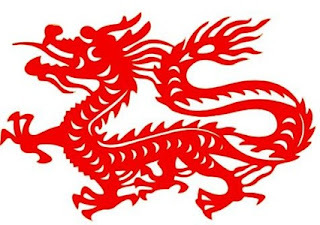 Soft economic data from China–such as business surveys–painted a healthy picture in late 2018, while hard data–such as industrial production and retail sales–pointed to worrying weakness. Incoming data have generally disappointed market expectations. Growth has slowed for two main reasons, in our view: policy-led constraints to clamp down on excessive credit expansion implemented in the past and much greater uncertainty arising from the U.S.-China trade dispute, especially for China’s key industrial sector. The auto sector has been a notable weak spot: sales have fallen off a cliff over the past year. Factors that had juiced auto sales have subsided and taken a toll on demand. In addition, authorities have cracked down on peer-to-peer lending, and the wealth effect from the previous surge in property prices has worn off. China’s government recently said there may be local-government support for the car market on the way, but this underwhelmed those hoping for a central-government boost to the sector. To help the broader economy, policymakers in China have already started to reverse course and moved toward a material policy easing. We are likely to see officials balance efforts to provide economic stimulus and also limit financial leverage, especially among state-owned enterprises, over coming months. A personal income tax reduction–equivalent to around 35 basis points of China’s GDP–came in to effect on Jan. 1 and a corporate Value Added Tax (VAT) cut–equivalent to around 50 basis points of GDP–will likely be announced in March. These tax cuts should be supported by the more traditional stimulus measures of infrastructure spending and housing market support. 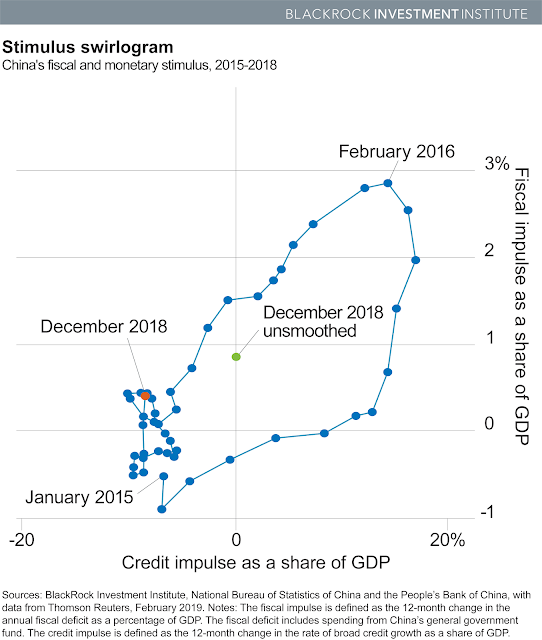 The Stimulus swirlogram chart below compares the 12-month changes in China’s fiscal deficit and credit growth (the fiscal and credit impulse) as a percentage of GDP. We show the 12-month changes in order to smooth through monthly volatility. The green dot depicts the latest data based on a six-month change to indicate where our more smoothed measure could be heading. The outcome? We are already seeing a return of support from both fiscal and monetary policy, and we would not be surprised if the stimulus intensifies in coming months. For now, however, the risks to our economic outlook are still tilted to the downside. China, for instance, might struggle to cushion its economy against the fallout from trade tensions as companies reorient their supply chains and technology access becomes increasingly restricted. Yet our base case is that a modest growth re-acceleration in Chinese manufacturing will help temper the economy’s medium-term downtrend. Courtesy of Elga Bartsch, PhD, Head of Economic and Markets Research for the BlackRock Investment Institute, is a regular contributor to The BlackRock Blog (more by BlackRock here).